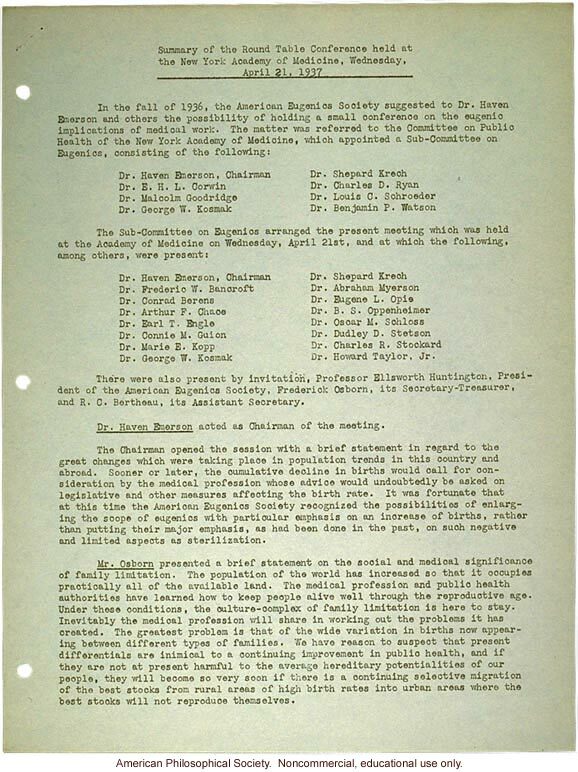 Summary of the Round Table Conference held at the New York Academy of Medicine, Wednesday, April 21, 1937 In the fall of 1936, the American Eugenics Society suggested to Dr. Haven Emerson and others the possibility of holding a small conference on the eugenic implications of medical work. The matter was referred to the Committee on Public Health of the New York Academy of Medicine, which appointed a Sub-Committee on Eugenics, consisting of the following: Dr. Haven Emerson, Chairman Dr. E. H. L Corwin Dr. Malcolm Goodridge Dr. George W. Kosmak Dr. Shepard Krech Dr. Charles D. Ryan Dr. Louis C. Shroeder Dr. Benjamin P. Watson The Sub-Committee on Eugenics arranged the present meeting which was held at the Academy of Medicine on Wednesday, April 21st, and at which the following, among others, were present: Dr. Haven Emerson, Chairman Dr. Frederic W. Bancroft Dr. Conrad Berens Dr. Arthur F. Chace Dr. Earl T. Engle Dr. Connie M. Guion Dr. Marie E. Kopp Dr. George W. Kosmak Dr. Shepard Krech Dr. Abraham Myerson Dr. Eugene L. Opie Dr. B. S. Oppenheimer Dr. Oscar M. Schloss Dr. Dudley D. Stetson Dr. Charles R. Stockard Dr. Howard Taylor, Jr. There were also present by invitation, Professor Ellsworth Huntington, President of the American Eugenics Society, Frederick Osborn, its Secretary-Treasurer, and R. C. Bertheau, its Assistant Secretary. Dr. Haven Emerson acted as Chairman of the meeting. The Chairman opened the session with a brief statement in regard to the great changes which were taking place in population trends in this country and abroad. Sooner or later, the cumulative decline in births would call for consideration by the medical profession whose advice would undoubtedly be asked on legislative and other measures affecting the birth rate. It was fortunate that at this time the American Eugenics Society recognized the possibilities of enlarging the scope of eugenics with particular emphasis on an increase of births, rather than putting their major emphasis, as had been done in the past, on such negative and limited aspects as sterilization. Mr. Osborn presented a brief statement on the social and medical significance of family limitation. The population of the world has increased so that it occupies practically all of the available land. The medical profession and public health authorities have learned how to keep people alive well through the reproductive age. Under these conditions, the culture-complex of family limitation is here to stay. Inevitably the medical profession will share in working out the problems it has created. The greatest problem is that of the wide variation in births now appearing between different types of families. We have reason to suspect that present differentials are inimical to a continuing improvement in public health, and if they are not at present harmful to the average hereditary potentialities of our people, they will become so very soon if there is a continuing selective migration of the best stocks from rural areas of high birth rates into urban areas where the best stocks will not reproduce themselves.